Ms. Hashimah Ismail was appointed to the Board of ICB Islamic Bank Ltd. on 6th February 2014.A lawyer by profession, she spent the major part of her career in private law practice focused on adversarial civil litigation including banking, personal injury and Syariah family law. 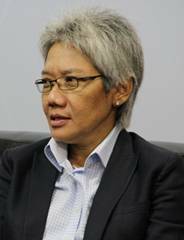 She ceased law practice in March 2000 to assume the position of Executive Director Dealings, firstly at Alor Setar Securities Sdn. Bhd. and later the enlarged entity of Kuala Lumpur City Securities Sdn. Bhd. ; responsible for the management of all the licensed dealer’s representatives, corporate governance and compliance with all the rules, regulations, policies, procedures and directives of the Kuala Lumpur Stock Exchange, the Securities Commission of Malaysia as well as the internal policies of the company. She served in this position until her departure inJanuary 2005, when the stock broking company was purchased by and merged with a large local bank. Copyright © || ICB Islamic Bank Ltd.